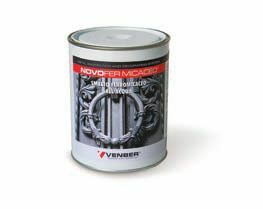 Water based enamel, based on acrylic resins and special micaceous platelike form to protect and decorate iron, zinc, masonry and woody surfaces. It creates a protecting, opaque, metal-like film which is highly resistant to UV rays, atmospheric agents and corrosion. Universal product for almost all bulding industry substartes: iron, zinc-coated, wood, PVC and masonry surface. Antique effect, esternal high resistance, quickdrying, odourless, water based product. It stops corrosion.